Some call it gravy, some call it sauce. We all say it’s delicious. Since I was a kid it’s been my favorite food – so much so that I’ve been known to eat it from a bowl with a spoon and a side of bread. Especially when it was fresh from simmering on the hot stove. As an adult I like to make my own just the way my mother taught me but I don’t always have the time in my busy day to do so. Many jarred sauces leave a lot to be desired with the addition of so many unnecessary extra ingredients such as sugar. So when I do buy jarred sauce I look for varieties with fewer grams of added sugar. For me it’s preference. I just don’t like my sauce sweet. 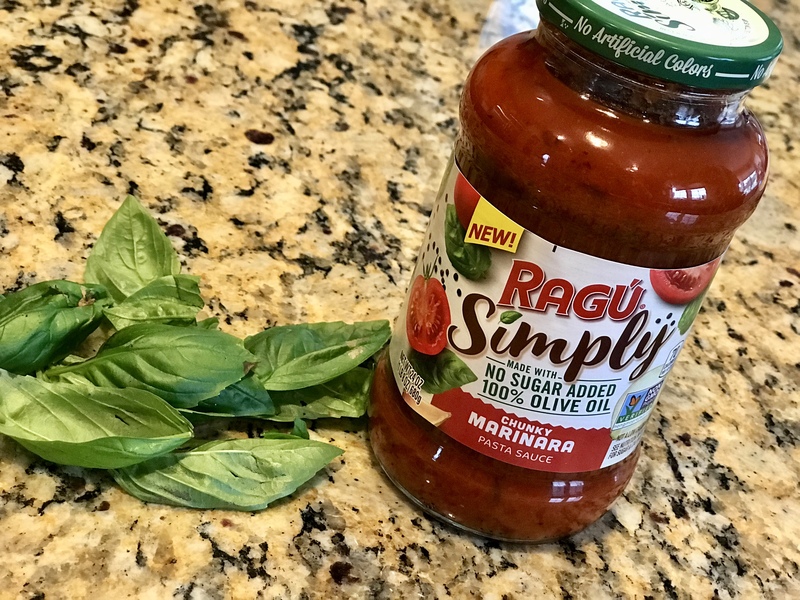 I was delighted to find the NEW RAGÚ® Simply Chunky Marinara Pasta Sauce which is made with 100% Olive Oil and contains no added sugar. It tastes delicious too. Who needs sugar in pasta sauce? Not me! The simpler the better when it comes to my sauce. This one contains onions, garlic and other spices with chunks of delicious plump tomatoes. Lately I’ve been crazy about cauliflower. Roasted, in soup, riced. I can’t get enough of it! 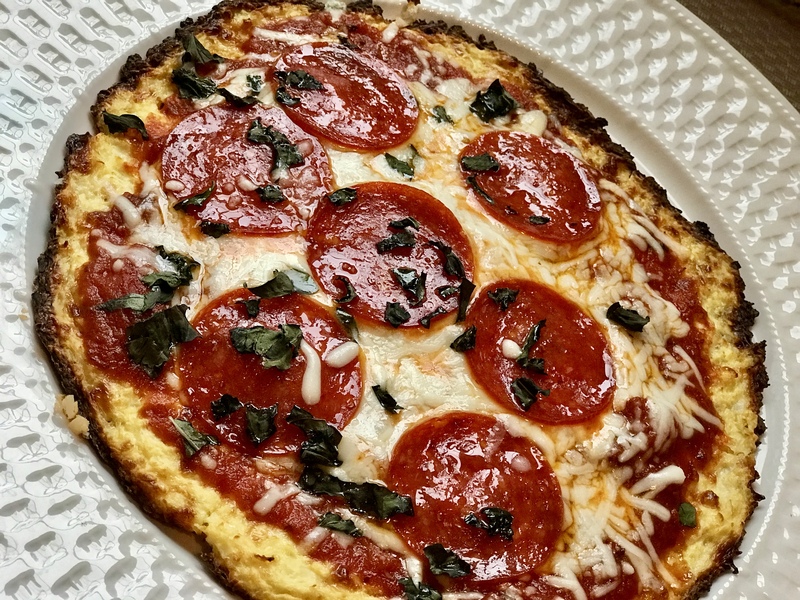 I’ve tried store bought pizzas and I love them but I run out of freezer space fast so I wanted to try my own cauliflower crust. You know I don’t do complicated, so when I tell you it’s easy I’m being 100% truthful. 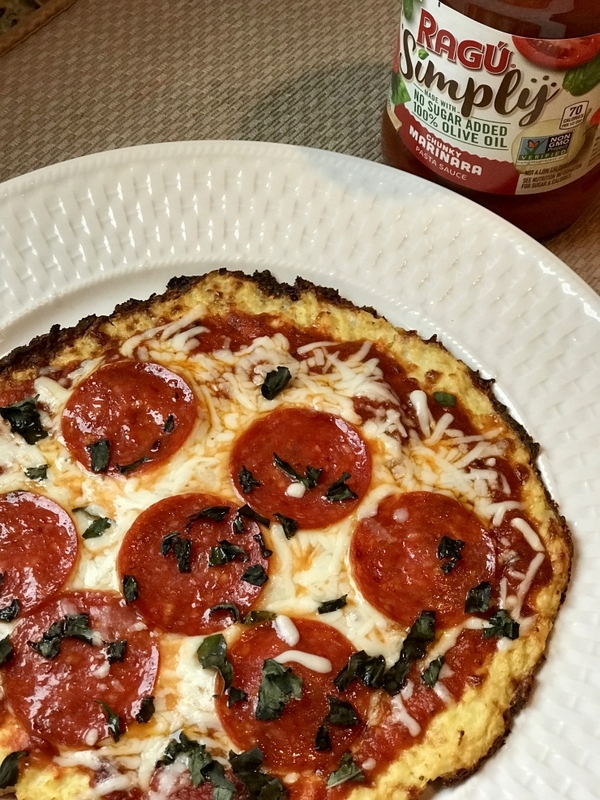 Cauliflower crust can be tricky, so I prefer to make smaller personal pizzas so the outcome is a nice crisp crust. I buy the frozen riced cauliflower from Costco that are individually packaged into 12-ounce bags. Simply defrost, mix in eggs and cheese and shape into a crust. I told you it was easy. After baking is complete, add your toppings and bake until the cheese has melted. This recipe, like the NEW RAGÚ® Simply Chunky Marinara Pasta Sauce is something I can feel good about feeding my family. The sauce has all it needs and the taste truly shines through. Crispy homemade cauliflower crust personal pizza. Microwave cauliflower for 8 minutes. Once cool, place cauliflower in a linen towel and squeeze out any moisture. In a bowl, combine cauliflower, egg and cheese. 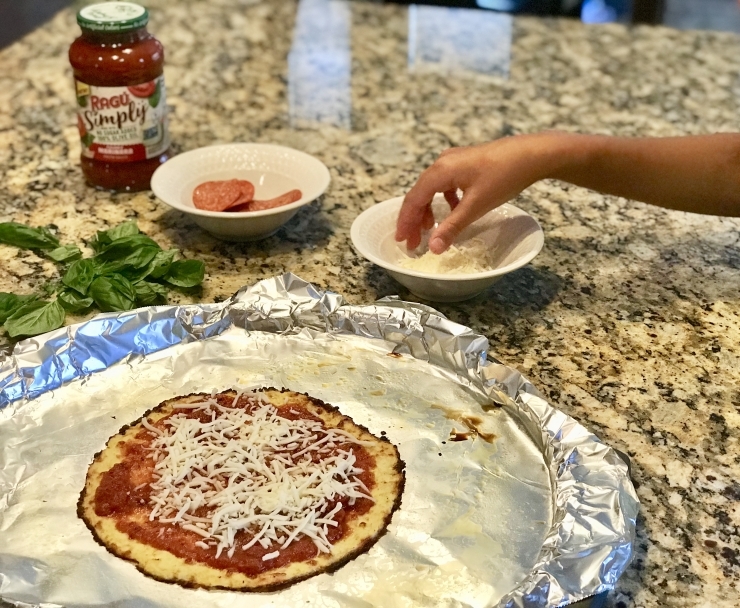 Line pizza pan with sprayed foil or parchment paper and shape cauliflower into a crust. Bake crust for 20 minutes at 450 degrees. When done, add sauce, cheese and toppings and bake for an additional 5 minutes. RAGÚ has graciously offered to create an extra custom box for us to use as giveaway for your readers. Would you mind linking to the Rafflecopter giveaway within your blog post ? We will be choosing 1 person to win the same box and contents you received. We’re referring to it as a RAGÚ® SIMPLY PASTA SAUCE Prize Pack. Open to US residents only.